Seoul, South Korea (CNN) -- While in high school, Cheong Beom-seok often slept through his classes and played online games seven or eight hours at night, sneaking in front of the computer while his parents were in bed. "I then started to like playing soccer, going drinking with friends and talking," Cheong told CNN in a smoky basement Internet cafe, or "PC bang," in Seoul. Now 23 years old and at the prestigious Korea University, Cheong is down to playing two or three hours on "Starcraft" and "World of Warcraft" three times a week, and believes he's kicked his virtual addiction. Cheong, however, may be in a minority of recovering Internet addicts. The South Korean government estimates that the country has 2 million citizens addicted to the Internet -- the darker side of being one of the world's most "wired" -- and is launching a fresh attempt to address the country's online addiction. Internet addiction has been a South Korean headache for almost a decade where more than 90 percent of households are connected to high-speed broadband and some 25,000 PC bangs supplying extra gaming space. "The situation is serious," says Lee Dong-hun, an assistant professor of Counseling Psychology in the education department at Pusan National University. "Internet addiction problems are not only seen in school age children, but also college students and adults with jobs. It's a complicated psychological and social environmental problem and it's not easy to help." Some recent extreme cases of Internet addiction have made for some shocking headlines: Earlier this month a three-month-old baby girl succumbed to malnutrition while her parents spent 12-hour stretches in an Internet café playing the role-playing game Prius Online, police said. In another tragedy last month, officials said a 22-year-old man returned to an Internet cafe to continue playing immediately after he murdered his mother, who had complained about his gaming habits. Physical exhaustion after long computer sessions has also caused deaths. While other psychological problems may well have contributed to these sad cases, symptoms and causes of Internet addiction are difficult to tell apart, experts say. Most South Koreans survive in a highly competitive society but those who can't, turn to the Internet. South Korea's approach has veered from drug abuse-style treatments and private-run boot camps to measures against behaviorally based addiction such as gambling. South Korea's new initiative is called "i-ACTION 2012," an umbrella acronym for a spread of approaches labeled "Attention, Counseling, Training, Institution, Outcome and Networks." It aims to make thousands more advisers available for its treatment centers and counseling hotlines and to launch an educational warning campaign. Internet addicts will also be offered free software with a timer that shuts down their computers or a "fatigue system" that bores players by making games slower and more difficult. Still under consideration and more contentious is banning long business hours for Internet cafes. They currently operate 24/7 and typically offer the latest popular massively multiplayer online game (MMOG) for about $1.10 an hour. That won't work, said Simon Lim, CEO of ThisIsGame.com, South Korea's leading gaming Webzine. "You don't only play one game in a PC bang. Every house has broadband so you can continue playing at home," Lim told CNN, adding that South Korean teens typically switch between three games at a time. "The government can't be overly rigid and take a forcible approach -- it will have a bad effect," said Cheong. 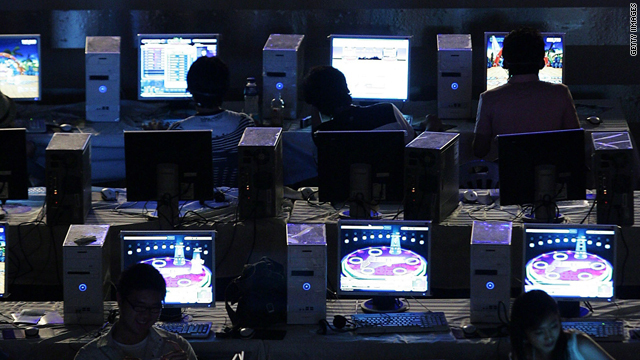 Owners of Internet cafes point to the larger pressure of South Korea's non-stop, hyper-competitive society. It starts at school with pressure to pass exams and gain sought-after university places. South Koreans work 2,256 hours per year, among the longest in the world, according the Organization for Economic Co-Operation and Development (OECD). "South Korea is very dynamic but it's a very stressful society that demands long working hours and tough competition. Most South Koreans survive in that society but those who can't, turn to the Internet," Lee told CNN. Some of the suggested new measures to curb Internet addiction could collide with a gaming market that is expected to be worth $5.5 billion this year with a 17 percent growth rate, according to the Korea Creative Content Agency (KOCCA). There are now just under 30,000 game developers in Korea that generally provide major games for free. The companies make their money selling add-ons such as weapons, outfits and special abilities for the online characters. South Korea's Internet cafes also reaped the benefits, taking in $600 million last year, according to government figures. Another novel idea to curb addiction is to punish excessive playing by confiscating gamers' virtual wealth. South Korea's Supreme Court ruled in January that assets earned in gaming -- in that particular case, virtual money from the online game Aden -- could be bought and sold for real-life cash. That trade can now potentially emerge from the shadows of so-called black market "workshops," where it is estimated at $240 million annually. Game makers are cautiously waiting to see what exactly the government is planning and have so far said they support playing with moderation. Some also fund treatment and counseling programs. "Games can be an energizing element for modern people, but it's only meaningful when it's in harmony with life and family," said Taek Jin Kim, CEO of leading game developer NCsoft, in comments provided to CNN. "We are examining various technological directions to prevent excessively continuous game play even for adults, and we are also discussing a special system that will allow children and teenagers to learn a healthy gaming habit," added Jaesung Lee, NCsoft's Vice-President of External Relations and PR. The solution must be "holistic," says Lee, who urges more programs to help children deal with their stress and more awareness of the problem among school teachers. "The approach should be like oriental medicine," said Lim, "where you don't just attack the sickness but you work to make the healthy sectors stronger and weak organs healthier, to better defend against the bad."